Patio design can do many things for your yard. It can act as a transition element, a supporting landscape element, or a major zone of interest in its own respect. Patios can also be any size you need them to by. 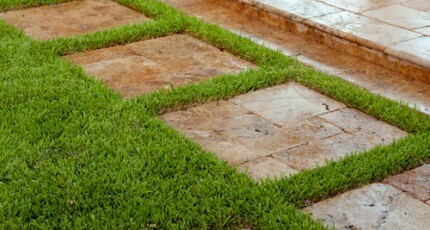 They can also be built out of whatever materials best support your Houston landscaping design. Common examples include pavers, flagstone, brick, stone, concrete, and decorative concrete. There have even been occasions where we have built wooden patios very similar to decks, but more central to key landscape points and more connected to a variety of zones of interest. We often use patio design as a transitional element between two zones of interest. If you have a wide space to one side of your home, for example, a patio and courtyard can be created to work as a sort of entry garden that introduces your guests to your backyard. Patios built adjacent to a rear entrance to the home help transition its architecture into the surrounding softscape. These small patios are very important to couples who want a private space just big enough for two where they can sit in the mornings and late evenings and enjoy a relaxing conversation. 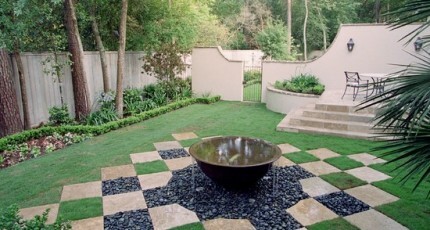 Houston patio design is also an important part of garden design. Many large gardens require a central gathering area in order for guests to fully appreciate their entirety. Small patios surrounding statuary, custom fountains, or stone benches are used in these gardens to create a central focal point where people can relax and enjoy the garden from within. In many cases too, a patio is used as a supporting element that enhances a major landscape element. A swimming pool is the element we most readily visualize when we think of something supported by a patio. Very few pools are built without some kind of surrounding hardscape. A pool patio creates a place for people to gather around the pool comfortably. It also links architecture, garden design, and other elements of softscape to the pool itself. 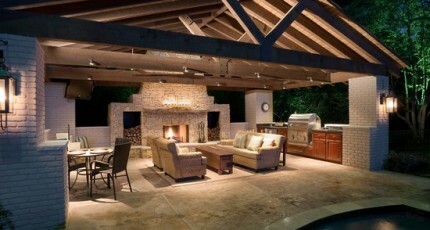 Another element that is typically supported by Houston patio design is an outdoor kitchen. An outdoor kitchen does not technically need a patio, but it is much nicer to have one that includes an outdoor dining area where you can enjoy dinner in a shaded, open air environment. There are other elements as well that integrate patios into their central structure. Outdoor fireplaces and courtyards depend on the presence of a seating area that will provide ample room to accommodate an anticipated number of guests. The decorative patterns in the materials used to build these structures serves as further reinforcement of the home as the central figure of Houston landscaping design. Finally, patio design is often used to create an entirely new zone of interest unique unto itself. Morning gardens, for example, are basically patios with fountains in the center surrounded by garden plants. Sometimes front yard patios are built to create a visitation spot for passing neighbors that politely keeps them from coming inside or inviting themselves to the pool. In modern landscaping and contemporary landscaping, custom patios are built in far reaches of the yard to create outdoor art galleries where people can enjoy dinner and drinks in an eclectic setting.